The project entitled „National Multidisciplinary Laboratory of Functional Nanomaterials – NanoFun” is financed by Innovative Economy Operational Programme , Priority Axis 2: R&D Infrastructure, Action 2.2: Support of Formation of Common Research Infrastructure of Scientific Units. The project has been awarded and is implemented by the NanoBioGeo consortium consisting of 10 institutional partners: 9 academic and one high-tech spin-off company. The main task of the NanoFun project is to set up a national network of 14 new collaborating laboratories, providing unique experise in Poland. Most of the experimental techniques implemented in the network of the NanoFun laboratories are hard to access in Poland and some will be available in Eastern Europe for the first time. Thus the project will influence a progress of basic and applied sciences in Poland and regionally. The project has received nearly 100 letters of intent to collaborate. 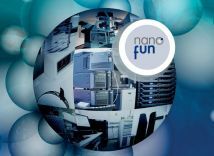 The structure of the NanoFun laboratories network takes the optimal advantage of the allocation of human resources to provide a basis for synergistic development of new functional nanomaterials. It will allow for focusing on the current basic research topics, and, at the same time, it will foster development of applications in the fields of nanotechnology, microfluidics, plant biotechnology, and medical sciences. Scientific potential of the NanoFun project arises from a broad spectrum of multidisciplinary nano- and biotechnological research activities in the range of priority topics of the Innovative Economy Operational Programme: INFO-TECHNO-BIO that encompass new materials and technologies, nanotechnologies, computational sciences, biotechnology, environmental protection as well as basic scientific research for future applications.